Every bride wants her wedding ceremony to be unique, memorable and reflective of your love and commitment to each other. 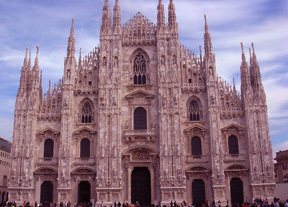 If you're the type that likes a lot of pomp and circumstance, just imagine yourself walking down the aisle of this magnificent church? You can hear the melodic organ playing "Here Comes the Bride" as all your guests stand to watch you walk toward your husband to be. 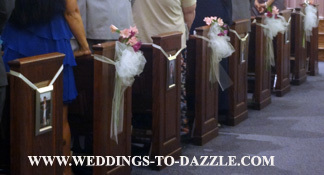 It is very elegant to have flowers, bows, candles or other decorations lining the chairs or pews on either end of the aisle. This enhances the ambiance of the ceremony and adds a fashionable touch to your wedding. Imagine how honored your mom and mother-in-law will be if you kiss them before taking your place with your husband! Ask your officiate if it is permissible for you to face your guests instead of having your back to them. 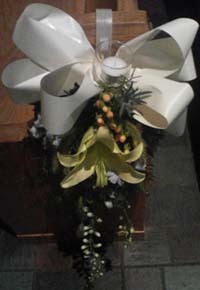 A unique idea to decorate your pews is to alternate flowers with photos of you and your hubby. You can begin by having a baby picture of you, then one of you as you are growing up and have the last several pictures of you and your hubby at different stages during your relationship. You can do the same on your husband's side of the pews. Your guests will enjoy looking at the pictures and also enjoy the beauty of your flowers. Just obtain your officiant’s approval before your wedding day. Unique ideas for wedding ceremony can be enhanced by having a friend or family member read a special poem or sonnet. 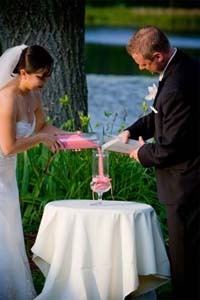 To show a sign of blending the two families together, consider using sand to personalize your ceremony. Purchase three clear vessels or vases along with black and white sand or two different colors of sand that are part of your wedding palate. Fill each vessel with one color and leave the remaining one empty. Ask each set of parents to join you by pouring some sand into the empty vessel leaving a little space for you and your husband to complete filling of the vessel. This is a dramatic effect that supports your lives as becoming one. If your budget permits, hire a violinist, accordionist, harpist or other musician to entertain your guests while they wait for you to take your pictures after your ceremony. 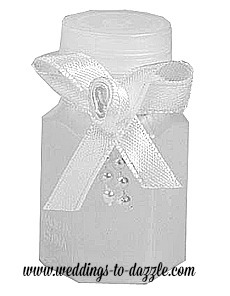 And of course, don't forget the bubbles for your guests to spread while you are leaving the church. Your ceremony is about joining you and your fiancé in holy matrimony. Plan your ceremony for you and use any of my unique ideas for wedding ceremony to help you accomplish your goal. And more planning ideas can be found here.